I’m 47 years old, a screenwriter and film school instructor, 8,000 kilometres from my West Coast Canadian home, and spending a pleasant afternoon picking up donkey dung in France. I’ve learned donkeys are very neat animals and defecate in one area only until they move on to a new site, so collecting the straw-packed, flealess, and odourless droppings is easy. It’s a meditative activity—repetitive, private, quiet—and I’m as content as I’ve ever been. I’m not even bothered by the pouring rain or my wet boots squishing inside and out as I move from one dung pile to the next, changing course occasionally to dump my full bucket onto the growing mound in the corner of the wire-enclosed vegetable garden. Soaked through, like yesterday, when the four of us looked out in horror at this very spot and watched the escaping hens disappear among the trees. The day had started out innocently enough. While Evan repaired the bolt and hinge on the chicken coop door, our kids Emily and Alyd and I fed the two amiable grey donkeys apples from the orchard. We humans are all wearing a variety of ill-fitting raincoats and rubber boots borrowed from overflowing hooks and shelves lining the wall of the farmhouse mudroom. This organic farm, with its walnut grove and bird sanctuary, is miles from the closest town and by now we’re feeling like old hands at this mucking about business. No one is bothered by how they look, not even 18-year-old, red-haired Emily who has been known to moan on more than one occasion about our family’s serious lack of fashion sense. Evan calls us over to admire his work, proudly opening and closing the door of the coop several times to celebrate his accomplishment. Not bad for a man whose work days are usually spent dealing with rebellious teens, upset parents, and the occasional police officer and social worker. That’s when we notice the hens dashing their way to freedom into the nearby woods. Evan isn’t worried. He remembers our farmer host Katherine telling him he could let the hens run free while he worked on the coop and all he’d have to do was set out the bucket of kitchen scraps and call the birds, and they’d come back to the coop immediately. This is apparently news to the hens. Note: Add the following information to my “Things I’ve learned working on organic farms” list: Hens are fast; they are not cute clucking birds but mean-spirited, teasing creatures who can make humans looks stupid; and they don’t herd well. The only sentient being enjoying himself is Alyd. Considering how often he moans about the gardening, weeding, wood carting, and cleaning up chores he must do as his share of our volunteer work holiday on different organic farms, we have actually found a job he loves: chasing ex-chickens. We finally corner two of the birds and put the poor traumatised creatures into the newly secure coop, returning to the farmhouse in defeat to confess to Katherine that the rest of her hens are still running loose. Picking up donkey dung was not an activity I ever imagined myself doing, and liking when our family began planning our round-the-world backpacking trip. I’ve got a good life and know it. Emily and Alyd are terrific kids who aren’t afraid to ask questions and—for the most part—can clean up after themselves, literally and figuratively. Evan and I have been together for a long time, and although we’re too urban in our living to call ourselves hippies, we both have strong roots in all that word represents: freedom, love, adventure, change. 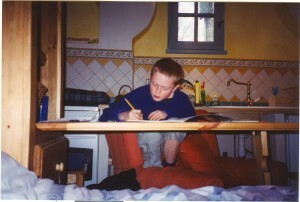 Evan, Emily, and I had taken a previous year-long sabbatical to explore Europe when Emily was six years old. The three of us lived in the Black Forest area of Germany where Evan taught German to French-Canadian army wives, English to German police officers, and delivered pizza at night. I made sandwiches in a deli and wrote angst-filled short stories. Emily attended grade one in a nearby school. We lived in a 200-year-old farmhouse above a long valley, able to look down from our 12” thick stone windowsills to a field where a stooped elderly woman in a black dress used a hand scythe to cut the tall grass. On weekends and during Emily’s school holidays, we went skiing in Austria, drove through winding mountain roads to cross the border and eat amazing meals in France, and visited art galleries in Switzerland. After a year, we returned to our home on the West Coast of Canada and settled back into our community and work. Four years after Alyd was born, we held a family meeting and decided it was time to plan our next adventure, this time a year-long trip. We hung a world map in the hallway and starting sticking coloured dots on all the countries we wanted to visit. For five years, we put 1/5 of Evan’s bi-monthly paycheque into a special bank account, watched hours of Lonely Planet shows, and took out travel videos and books from the library. At the end of the fifth year, we had a year’s worth of wages saved as our travel fund. We subtracted trip expenses and divided the leftover by 365 days, which gave us our daily survival travel allowance. 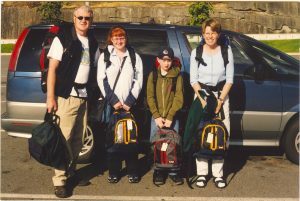 We rented our house to an engineer and his family newly arrived from Bogota, Columbia, bared our arms for $1,000 worth of travel vaccinations, filled one small backpack each with clothes, toiletries, a favourite novel, and booked four, round-the-world, open airplane tickets. We left lots of space in our itinerary for spontaneous changes in our travel plans. The first half of the year we would journey through South East Asia—Thailand, Indonesia, and three months in India—with Hong Kong as our travel hub. The second half of our trip would include Italy, France, and Turkey, with stopover time in London to visit Evan’s family. We looked at our travel plans, looked at our budget, and knew we’d never be able to afford six months in Europe with the four of us. Coming home a month before the July 1, 2001 launch on our trip, Evan heard a CBC radio show about WWOOFing, “World-Wide Opportunities on Organic Farms.” This organisation had begun in London in 1971 and was now active in over 60 countries around the world. Based on the simple premise that people will volunteer to work on organic farms in exchange for room, board, and a different cultural experience, there are presently 600 host farms in Canada, 500 involved organic farms in the United States through five different WWOOFing organizations including 50 farms throughout the Hawaiian Islands, 1,600 in Australia, 32 in the Czech and Slovak Republics, 160 in Austria, 2 in Bulgaria, 240 in Italy, 50 in Sweden, and continually growing numbers in such diverse countries as New Zealand, Israel, Brazil, Switzerland, Denmark, Turkey, Uganda, Ghana, Japan, Spain, Nepal, Mexico, and Iceland. WWOOF International operates out of England, so we got a money order (the membership cost varies by country and organisation), filled out the application form, and sent everything off to London. We were later emailed a website access code which enabled us to get individual work expectations and contact information for listed WWOOFing farms in the country of our choice. 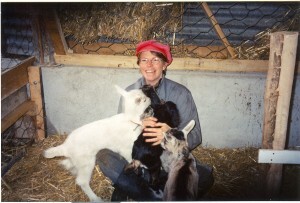 Each farm has particular volunteer work needs with a variety of living and work arrangements such as, “WWOOFers will be expected to work five days a week for eight hours per day with caravan accommodation, and you cook your own meals,” or “Six days a week for four hours, bedrooms in the main farmhouse, and you eat your meals with the family.” A WWOOFing working holiday can range from two weeks to six months. And you don’t need a work visa. Some farms only want single travellers, while others can easily handle eight or more WWOOFers depending on the season and workload. 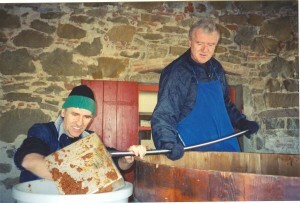 The main WWOOF website (www.wwoof.org) is packed with helpful information and includes links to other countries like Italy (www.wwoof.it) and the United States (www.wwoofusa.org) who are not part of the International WWOOFing organisation. Although I must acknowledge that our initial attraction to WWOOFing was financial, we also had a desire to experience some settled time in Italy and France, allowing us a chance to get to know people, politics, culture, and social mores on a more intimate level than one can as a tourist. It’s a win-win situation for both the volunteer workers and the farmers. The workers get a chance to learn about organic farming and to experience a different way of living far from their home while the farmers get help in the never-ending chores of running a farm, organic or otherwise. You can probably find a WWOOFing volunteer opportunity close to your town, or at least in your home province or state, if that’s more manageable for you. What our family didn’t take into consideration initially was the impact these experiences would have on all four of us, individually and as a family unit. Who would have thought Emily and I would turn into life-long goat fans, or that we would learn to differentiate between organic goat’s cheese and the standard supermarket brands? That Evan would find new physical strengths and building skills? That picky eater Alyd would discover he could eat anything, anywhere, in a variety of raw and cooked states, especially when he’d taken part in the harvest or preparation of the fruit, vegetables, and animal we then ate for dinner. Our grass-roots involvement in preparing the food we ate is not something most urban dwellers get to experience. We were introduced to alternative methods of eating, farming, and living, and macrobiotics, biodynamics, and homoeopathy became part of our language and our lives. We learned anew how every choice we make all day long impacts the planet, from the type and amount of food and water we consume to the discarded and recycled items we leave behind. When we eventually returned to our North Vancouver, Canada, home we came back awakened to the importance of listening to our bodies and with a renewed understanding of the impression we make on the earth with each step we take. This doesn’t mean you can only find volunteer work in isolated rural areas because there are numerous opportunities near urban settings too. WWOOFing possibilities are varied and endless. You could choose to fly up to a remote arctic wilderness resort in the Northwest Territories of Canada and spend a few weeks working in their greenhouse, helping with food preparation for their guests, and taking care of the sled dogs. Or go to Japan and work at a holistic medicine and natural farm. In Australia, you can look after alpacas and learn to do brickwork. Need a break from snow and cold winds? Volunteer on a coffee farm, spending your days surrounded by palm trees and exotic flowers on the big island of Hawaii. Or maybe you love horses. In New Mexico, you can become a WWOOFer on a 3,000-acre horse and cattle ranch, looking after grass-fed beef and Spanish Mustangs. Want to learn about wind and solar power? There’s always that eco-village of kindred spirits near the prairie city of Winnipeg, Manitoba. Or what about a New Zealand orchid farm? Interested in learning a new language? Open your atlas, close your eyes, point your finger, and pick a country. WWOOFing is not just for backpackers, ex-hippies, or wannabe gardeners. Everybody’s doing it: businessmen, concert violinists, nurses, miners, students, and grandmothers. Every kind of organic farm imaginable is out there, and all of you have skills needed by someone, from web design and cooking to child care or your ability to provide help with the digging, building, pruning, and milking. In any WWOOFing situation you choose, you’ll be working with people who have committed their energy, money, and livelihoods to ensuring the future of the planet is a healthy one. Most of the time your experience will be fun and impact your life in unexpected ways, but these are working farms, so there are no free rides. Also, farmers are like the rest of us, each WWOOFing host with their own way of doing things. Sometimes, personality clashes happen. Such is life. We all have things to contribute to the world, and WWOOFing is one way for us to satisfy a dream—or two—while also treating our planet in a graceful manner. I am unabashedly a flag-waving fan of WWOOFing and hope many more people will discover this incredible opportunity available to them. With our planet in such a precarious state—impacted by pollution, war, and a very non-future focused global economy—you and I can still find moments/days/weeks in our lives to live healthier and slower in a more meaningful manner and with greater kindness shown to each other and our planet. And those darn hens? Back at the farmhouse, Katherine, and her 16-year-old daughter Layla, start to laugh when they saw us: Evan sheepish, me tight-lipped, Emily scowling, and Alyd radiant, all of us wet and scratched, and some of us embarrassed at being shown up by eight female birds who spend their life pecking each other’s butts. “Oh well, if they have a death wish, so be it,” Katherine said. “They’ll come back to the coop at feeding time tonight.” Sure enough, when Evan returned to the shed at 7 pm there they all were, waiting patiently. He opened the coop door, and the hens scurried in, clucking non-stop toward the kitchen-scraps food bucket. WWOOFing allowed my family to expand our view of the horizon while learning ways we could each leave a light footprint on the path behind us. Because here’s the lesson of the day and life: You’ve got to speak the language of the land to attain success, right, chickee, chickee?